I dedicated this day as a "blog day" to work on the pending write-ups I meant to finish last month. But words, ideas and creativity didn't seem to work as the same speed as the bytes transmitted in my tab while I scroll down the news feed. Then my attention turned into the box sitting quietly in my room. It is a lonely old box that holds more than dust and unfinished projects. 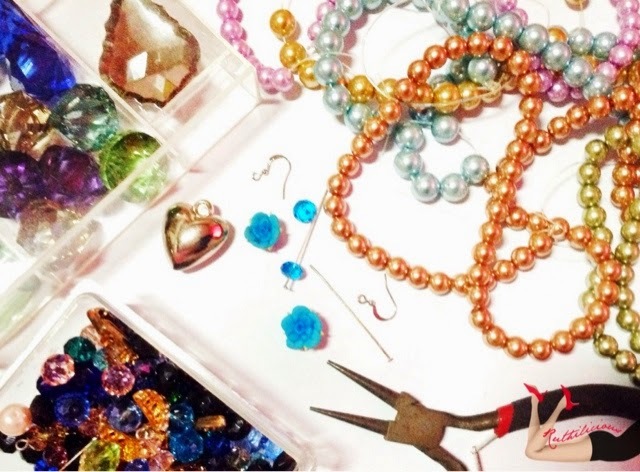 Beads, faux pearls, chains, charms and rusty old tools. I cannot remember the last time I touched them. But this afternoon, I am looking at them and touching them like it was the first time I am seeing them. Has it ever happened to you? Seeing an old item you always possess and forgeting that you always have it. I failed in stringing words today, but now, I am stringing beads and crsytals once again. The joy of reconnecting back to an old love. I remember how I would drag my mom to the market to get the little bits and pieces of things to complete my project. The projects that turn into collection and I have my friends to support and buy the little pieces that my humble creativity has produced. Until, at one point, it consumed me. Then, everything goes in to the old box. Years after, I am here, beading and letting my hands work again. I am not certain if I am feeling the same enthusiasm I felt the first time I started beading, or this is just a sudden euphoria I get as I temporarily shut down myself and disconnect with my world. It makes me think if this feeling holds true with old friends, old love, old memories. It is as if going back to something that once makes us happy is an escape from the reality we are faced now, or this is just to validate how we truly feel about our present. I started stringing beads today because words failed me.. Now. I am ending a blog entry. Stay connected with me, subscribe to my blog! If you like this post, click the like button or the Facebook Share button! Spread the love. Like my Facebook Fan Page at www.facebook.com/ruthiliciousblog or follow my updates on Twitter @ruthilicious. If you are reading this post somewhere, it is originally written by Ruth and published in www.ruthdelacruz.com.